Do you have an aging laptop that you want to save from the recycling center? With a few software and hardware upgrades, you could bring that old notebook back to life and possibly avoid having to plunk down cash for a new laptop or a secondary device such as an Apple iPad or an Android tablet. Back up first! Before making any operating system changes, be sure to back up your data to an external hard drive (or two), and confirm that you have all of your application discs handy so that you can reinstall them. Check our tips on what you should back up, as well as on how to back up manually or through Windows. 1. Reinstall Windows: Over time, Windows naturally slows down. A fast way to bring your laptop back to square one is to use your system-restore disc (or the restore program installed on the laptop) to reformat and reinstall Windows. After a fresh install, your system will run much faster, undoing the years of application installs and uninstalls, disk fragmentation, and everyday wear and tear. 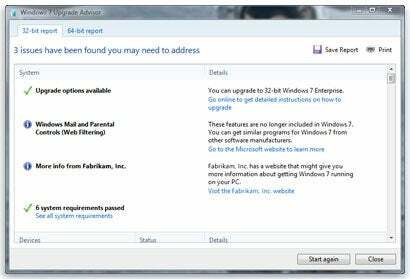 See our eight-step complete guide to reinstalling and restoring Windows for assistance in starting over from scratch. Unfortunately, reinstalling Windows from your laptop manufacturer's restore disc or program will also reinstall any bloatware that initially came with it. A few utilities can help you remove those useless programs: Previously we've mentioned Revo Uninstaller Portable, which is free and doesn't need to be installed on your laptop, as well as Total Uninstall ($30), which has more features, handles uninstalls that require a reboot, and can remove 64-bit programs. If you want a more automatic tool that finds bloatware for you, check out the free PC Decrapifier. 2. Upgrade to Windows 7: If you're running Windows XP or Vista, you may find much better performance under Windows 7--if your laptop meets the requirements for upgrading. Download and install Microsoft's Windows 7 Upgrade Advisor to determine whether your laptop can run Windows 7. At Microsoft's suggested retail price of $120 for the OS upgrade, this option isn't cheap. If you intend to use your old laptop as just a secondary computer, the investment might not pay off. But if you'll be using the laptop heavily, keep in mind that Windows 7 has been shown to run well on even very old and underpowered laptops and netbooks, and that it boasts a ton of nice features for connecting to other computers, finding your documents and other files, and using your laptop in general. Want to upgrade? Check out our instructions for upgrading to Windows 7, including how to perform the custom (that is, clean) install required for XP users, as well as the upgrade path for Vista. 3. Try Linux: For a free, lightweight, and secure operating system upgrade, consider trying Linux, specifically Puppy Linux. My PCWorld colleague Katherine Noyes pointed out several features of Puppy Linux that make it a nice option for older PCs, including its ability to run off a CD or USB flash drive, as well as its small footprint. It boots quickly, too. 1. Add memory: The easiest, and often the most cost-effective, way to add a performance boost is to install more RAM. If your laptop has 512MB or less of memory, you can boost its speed by a third by upgrading to 1GB. (Find out how much memory is installed by clicking Start, going to the Control Panel, and clicking System. In the General tab, you'll see the amount of RAM.) Memory is cheap these days--1GB of RAM can cost as little as $20--so I recommend upgrading to the maximum amount of memory your laptop can use. As mentioned in our guide to upgrading PC RAM, memory vendors Crucial and Kingston both offer easy-to-use tools for finding the right memory for your computer. 2. Upgrade the hard drive: Replacing your laptop's hard drive will not only get you more space, but it can also significantly increase the laptop's performance. Older laptop hard drives may have a low, 4200-rpm rotational speed; upgrading to a 5400-rpm or 7200-rpm drive will produce a noticeable speed difference during boot-up, data transfers, and general use. You can upgrade the hard drive yourself in just a few minutes. Before ordering the replacement drive, confirm what type of hard drive your laptop currently has (look on the drive itself for the interface type and height, or note the model number and look up the information on the drive manufacturer's website). A notebook hard-drive upgrade kit, such as those from Apricorn starting at $19, can clone your old drive and make transferring your data to the new one very easy. 3. Upgrade your Wi-Fi to Wireless-N: If your home router uses Wireless-N (aka the 802.11n protocol), you can get faster network connectivity on your laptop by upgrading the notebook's wireless card from the older 802.11b or 802.11g standard to the latest protocol. Wireless-N products have been shown to be as much as seven times faster than 802.11g. Another benefit: Since older wireless devices can drag down the rest of a Wireless-N network, upgrading your laptop can improve your network overall. Although it's possible to upgrade the wireless card inside the laptop, an easier option is to buy an 802.11n adapter that you just plug into the laptop's USB port. You can find an adapter such as the D-Link DWA-131 for about $20. The upgrades above can make your old laptop more usable. A refreshed old laptop is handy to have around as a backup in case your main computer fails. You might use the laptop as a quick information-lookup tool in the kitchen, or another area of the house. Or perhaps your kids, other relatives, or a charity could make use of it. If, in the end, you need to recycle the laptop, make sure to completely erase the hard drive first. To find a local program where you can donate or recycle the laptop, consult the U.S. Environmental Protection Agency's eCycling website. Follow Melanie Pinola and Today@PCWorld on Twitter.